Sitting in the (mostly) warm living room. It is funny that energy costs in Italy are four times the costs of other European countries and yet they have NO insulation in their buildings. We too have no insulation and live in a four hundred year (or thereabouts) building made of stone. Even though we have very good windows it remains drafty. I see it has been exactly a year since my first post. A lot has happened in that year. It kind of amazes me that we could pull off our dream with no serious hitches. Last December I was writing about our up-coming house hunting trip. 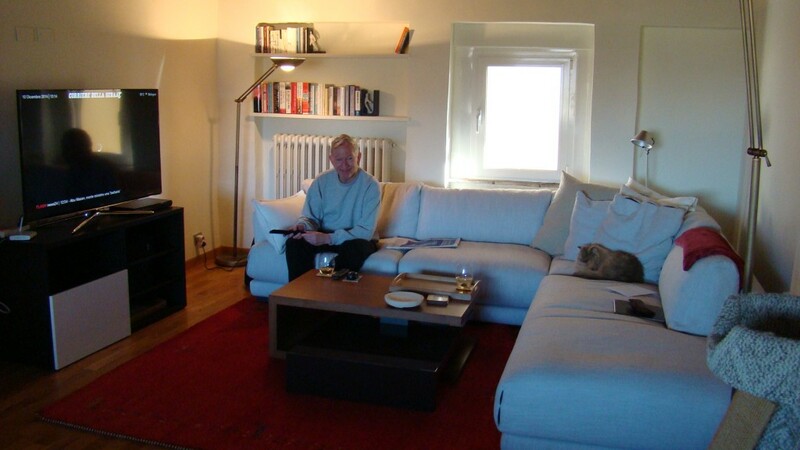 Today I am in my house in Italy! It was an incredible year. I have to be SO thankful to have found wonderful new friends in Susan and Gary who really helped us immeasurably. I look forward to many adventures with them. 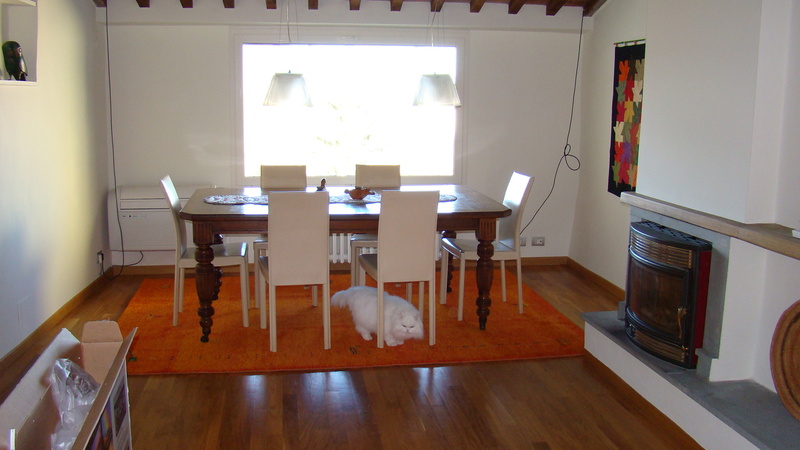 We also have found other friends John and Libby who live in Montone and helped us get our Permessi. I thank them as well. Hopefully next year we will be able to get to know them better. This next year we hope to start traveling some. We think our first trip will be to Barcelona. 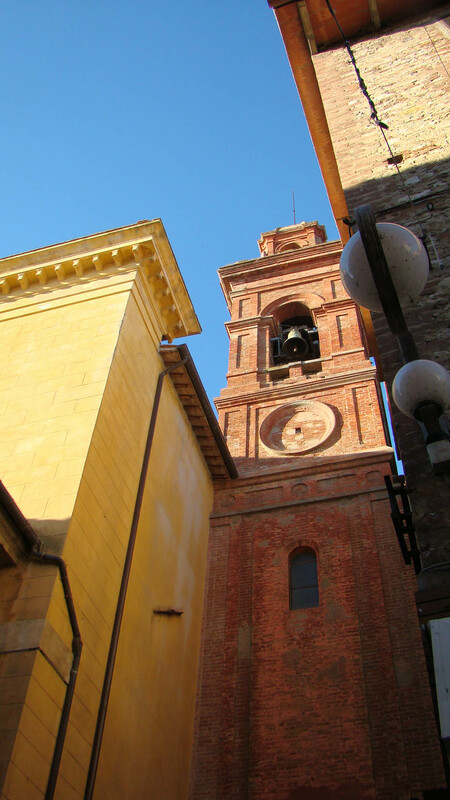 We can grab a quick and inexpensive trip on Ryan air from the nearby Perugia airport. They fly once a week on Thursday and return once a week on Sunday. That seems to be about right. Other places on our bucket list are Turkey, Croatia and Greece. All three are on the Adriatic so not far away. I also hope to take some classes in Italian from a school in Citta di Castello. Luther has arranged to practice his conversation with Vera who also cleans our house. He knows all the grammar but just needs practice speaking and understanding. 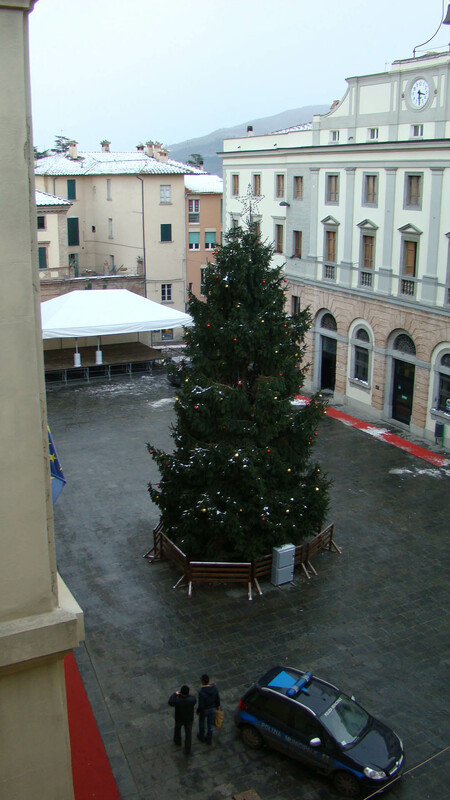 Tonight there is to be the big celebration Capodanno. Their way of celebrating the New Year. They have set up a bandstand on the Piazza. From what I am told the Umbertidese party until the wee hours. We shall see what they are made of because it is VERY cold here. 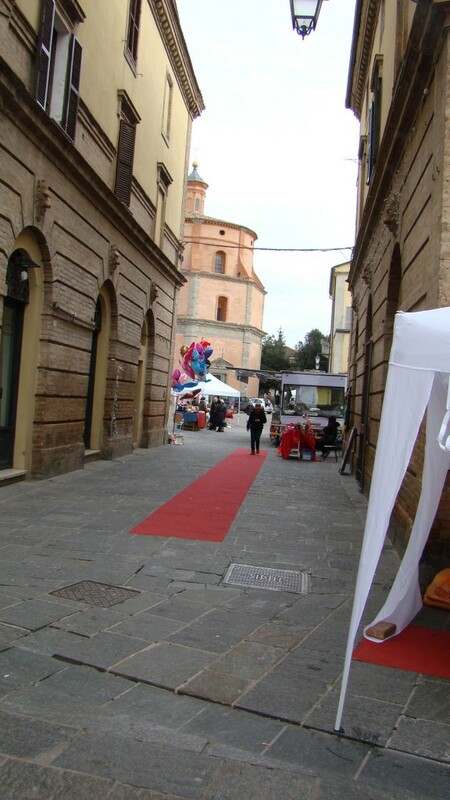 And the winds are whistling down the narrow streets and through the Piazza. I cannot imagine partying in that cold, or playing instruments. But they have cleaned up after the small market today, readying for the show! We shall see how much noise we get in our new house from a party on the Piazza. We are going over to Patrick’s Enotecca across the river. We are joining Susan, Gary and Susan’s sister and husband in some wine drinking and light dining. I am not sure I’ll last to midnight as I have a pretty nasty cold but I am up for trying. 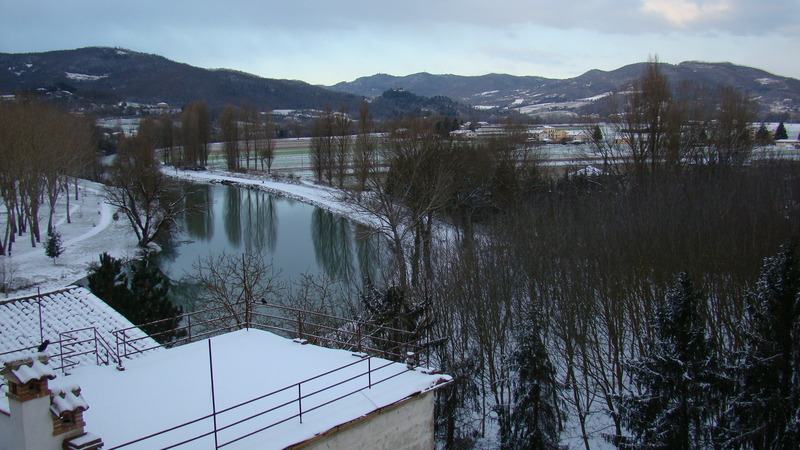 This entry was posted in everyday life in Umbria, Uncategorized on December 31, 2014 by Nancy Hampton. Today is December 30. Almost to the New Year. And what a year 2014 was for us as you all know! And this morning we awoke to a light dusting of snow. So pretty and so nice to be in our own house. 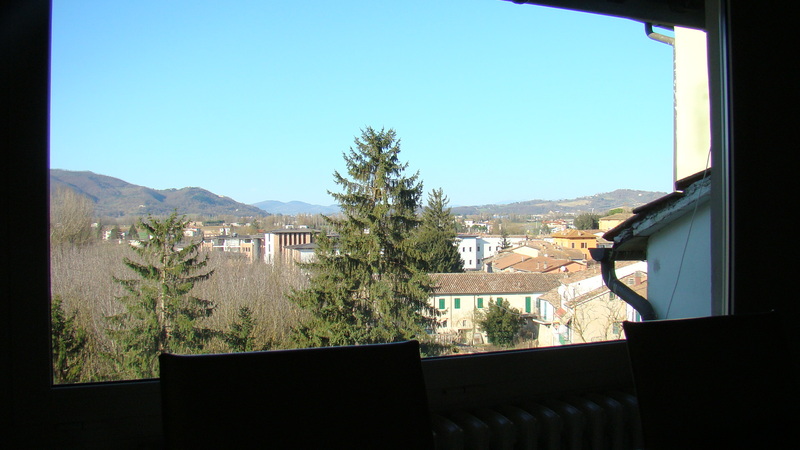 This entry was posted in everyday life in Umbria, Uncategorized on December 30, 2014 by Nancy Hampton. 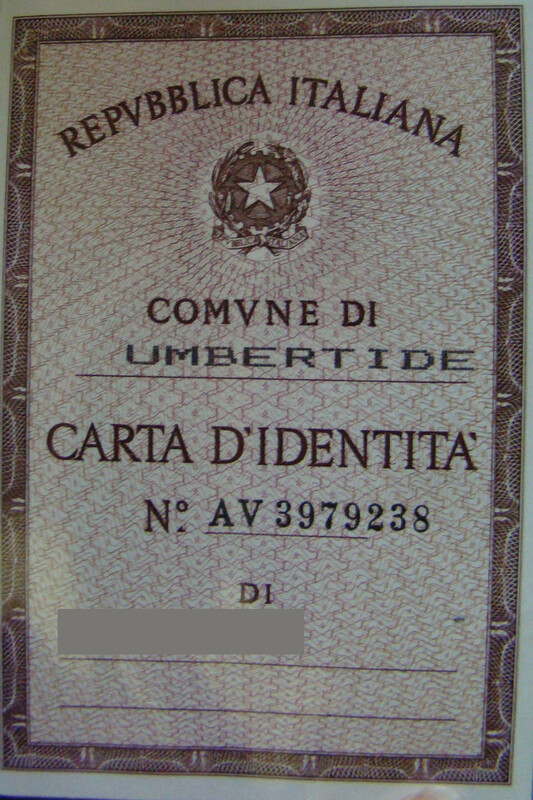 Carta d’Identita!! 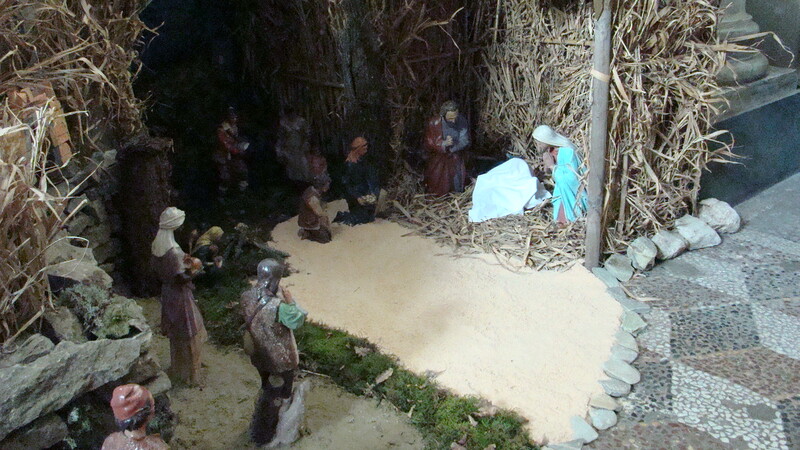 And Buon Natale! WOW! Today a red letter day! Here is what has been happening. 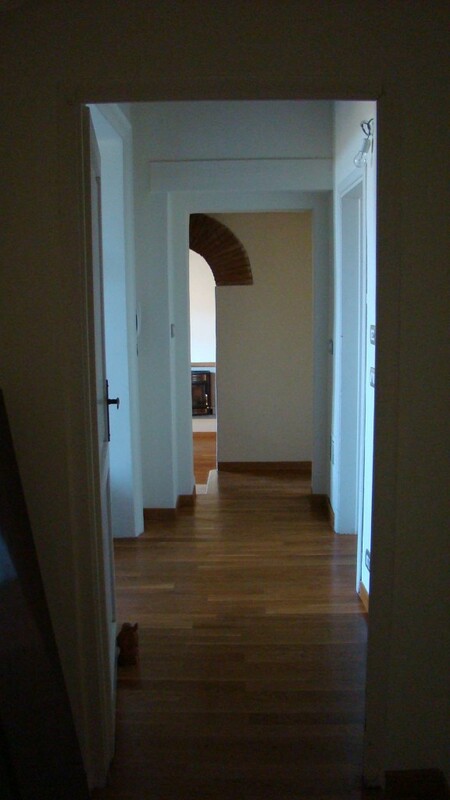 Since we received our Permessi last Saturday we have been working hard to get our Residenza. We went to the Comune (city hall) on Monday morning and they did the paperwork for our house. Putting it into our name and showing we will move in at the end of the year for garbage tax etc. We took that to another department where they filled out our papers to get our Residenza which will include a visit by the Police to our house to make sure we actually live there. On Tuesday we went car shopping in Perugia. It was not very hopeful. We thought we were going to have to order a car which would take a couple of months minimum. 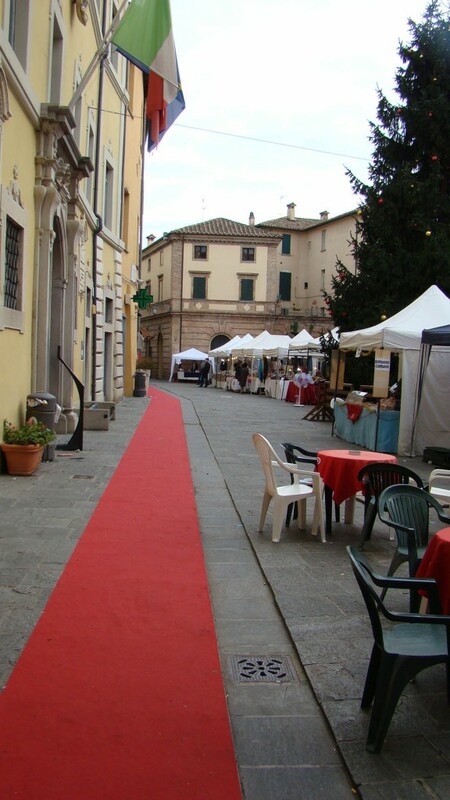 We decided we’d go up to Citta di Castello on Wednesday, Christmas Eve, where they have an auto row type street to see about ordering an Alfa. We went to the VW dealer first. The salesman was pretty helpful. We explained we needed to buy a car as soon as possible. He found a VW Golf Diesel with most of what we wanted in Arrezzo (not too far away). They would install the GPS for us at an additional charge. Seemed like a good deal. We told him we would think about it. We wanted to try the Alfa dealer. He pretty much laughed at us saying what we wanted was impossible. Since we did have the VW in hand we decided to go back and buy it. We did so. They explained that our Permessi were not enough to buy it. We had to have the Residenza. SO when we got back to Umbertide we decided to visit the Police to see if we could speed it up some. Serendipitously we ran into Jim (our realtor) as we were turning away from the Police door after reading their hours. Jim is not put off by closing time. He rang the bell and ushered us right in. He talked to the Policeman who found our visit request at the bottom of a big stack. He explained where we lived and he stamped all our papers and called ahead and we went up and GOT OUR RESIDENZA permits!!! 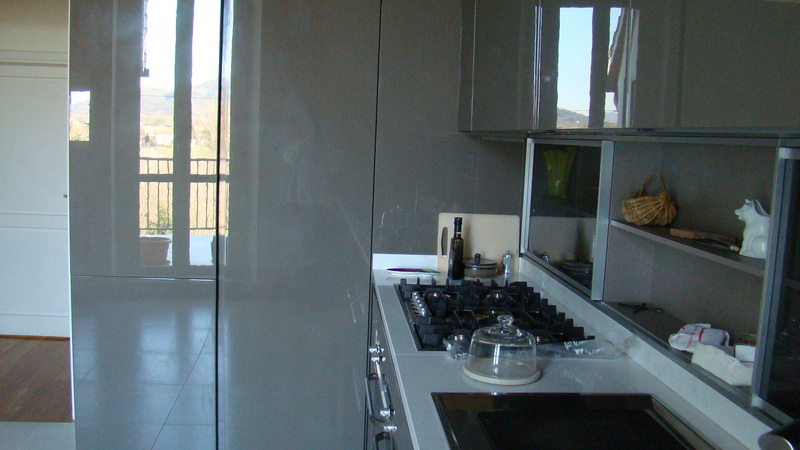 I think getting our Permessi and Residenza in only 3 business days must be a record. This means we can actually close the deal on the VW and return our rental without extending it (we hope!). This is a most welcome Christmas present for us! We got our guest bed head and foot boards. We also went to Castiglione del Lago with Susan and Gary for lunch on Sunday. It was a lovely, very mild day. Lots of folks out and about. We had a great lunch at Monna Lisa. This is a seafood restaurant that we were sure Susan and Gary would love as we had eaten there with Jodi and Don recently. 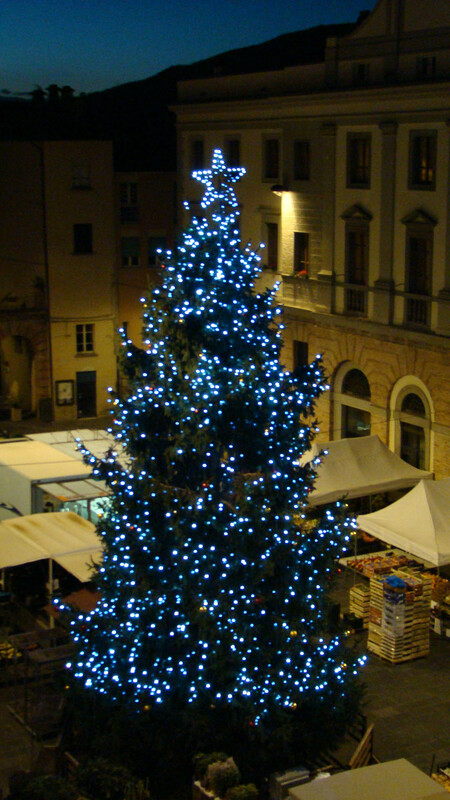 Finally, at the end of a very eventful year for us, we want to wish everyone a Buon Natale! We will have a nice Christmas Eve dinner with friends tonight. 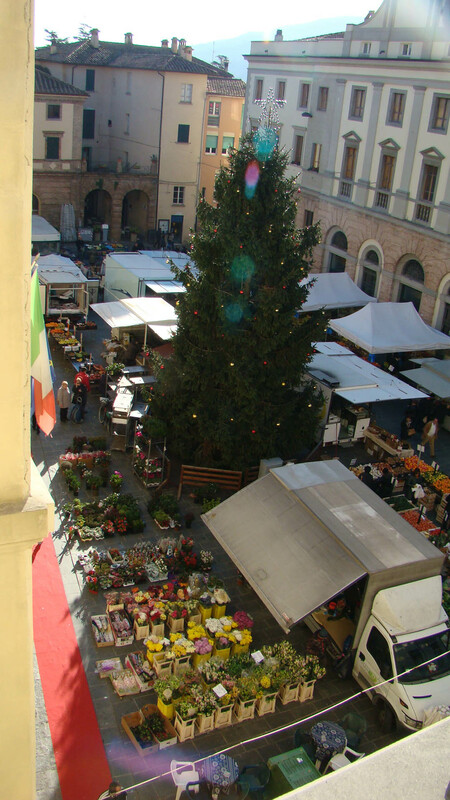 This entry was posted in Cars, everyday life in Umbria, italian paperwork, Permesso di Soggiorno, Uncategorized on December 24, 2014 by Nancy Hampton. Today was the big day. We drove up to Citta di Castello to the Questura to get our Permessi! I have to say it was a bit anti-climactic. Went in, got fingerprinted again, signed a paper and they gave us our cards. All done in 5 minutes. They are good until June 25, 2015. You know what that means, right? We pretty much have to start working on getting it renewed right away. Maybe it’s faster to renew? Who knows! Since we were up there we drove up to San Guigliano to the furniture store to pick out a table for our kitchen which we did. 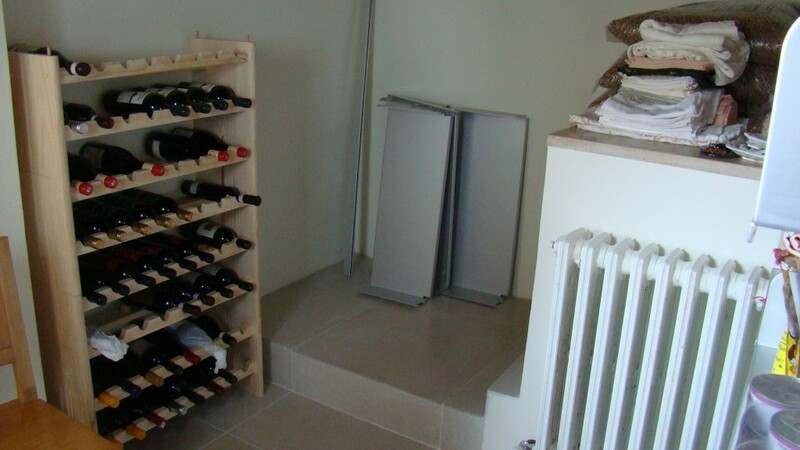 I hope it fits up the stairs! Always an issue here. This entry was posted in Uncategorized on December 20, 2014 by Nancy Hampton. We have done a few errands this week. We found a store called Leroy Merlin which is like a Home Depot. It has a lot of stuff we needed. I got some plastic bins to help organize stuff and some plug adapters. Luther said electrical stuff here is haphazard and I’d say that’s an understatement. Everytime I go to plug something in I need an adapter. They have grounded plugs and ungrounded plugs and the reverse for outlets and I never have what I need! 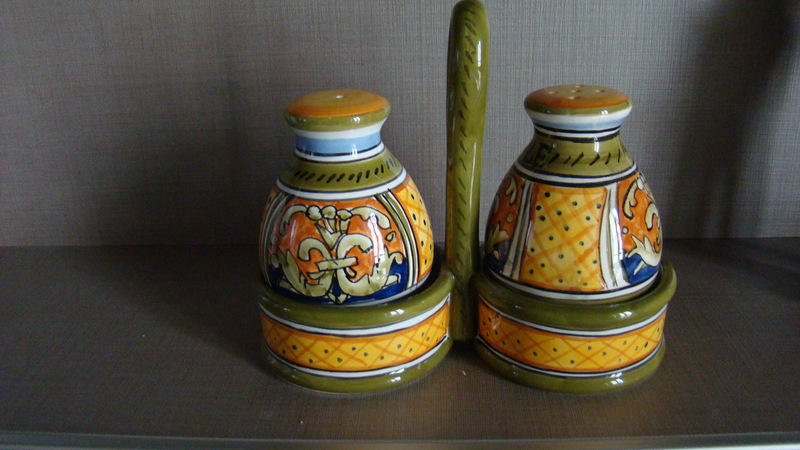 We also paid a visit to Deruta of ceramics fame. I bought some salt and pepper shakers and a utensil holder for my counter. We got our stuffa (pellet stove) working. Yay! 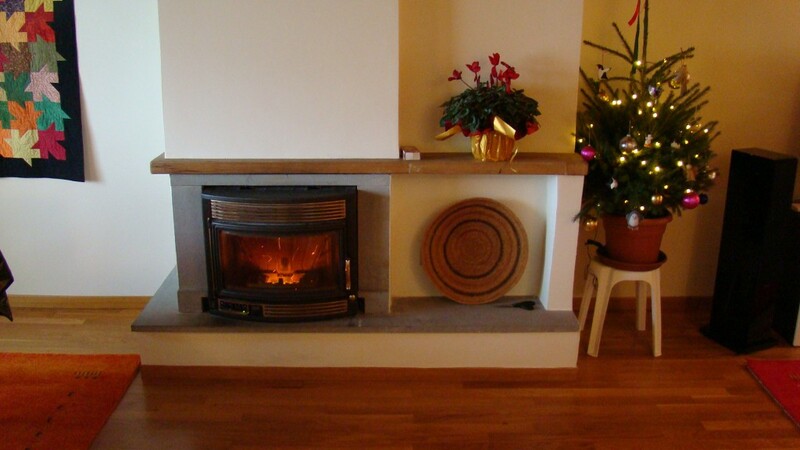 Keeps the room nice and warm and is pretty festive next to the tree don’t you think? We also got our grill!!! 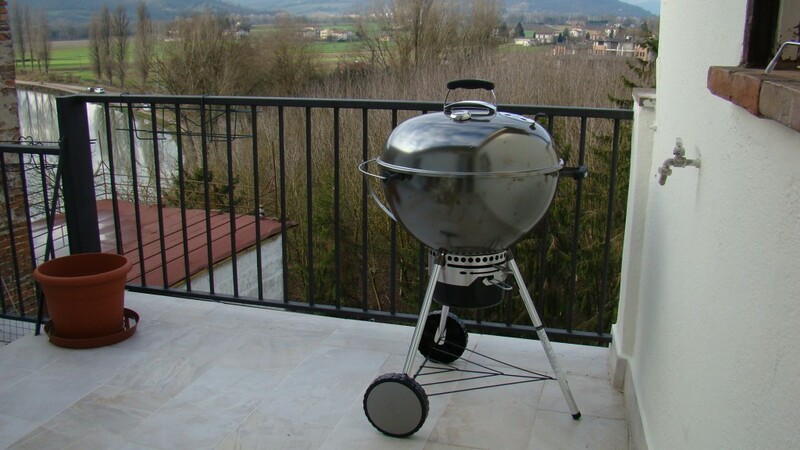 We ordered a standard Weber grill which I am intimately familiar with. Now I can start cooking but first I need to find charcoal. Baby steps. Luther put the grill together while I was working on lunch for our first guests. We invited Susan and Gary and Joseph and Paul (all American lunch!) and I decided to buck tradition and make a green pozole since I had shipped some of the needed ingredients. It was a bit different because I had to substitute some stuff but it came out pretty good. Anyway my guests seemed to like it. I think when I cook, if possible I’ll make things that we can’t get here. It is nice to have some variety. We really enjoyed entertaining in our new home! 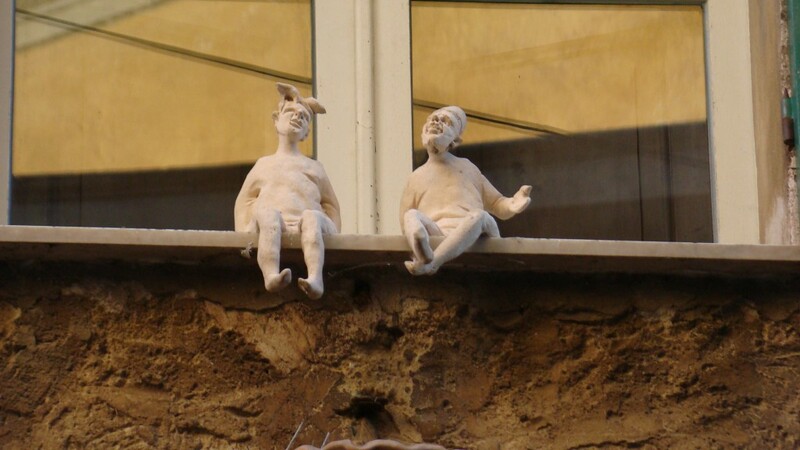 This entry was posted in everyday life in Umbria, Uncategorized on December 19, 2014 by Nancy Hampton. 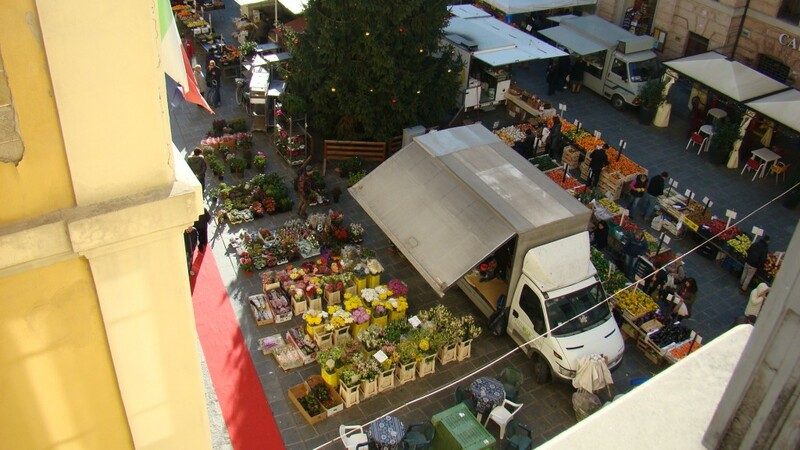 The Christmas Market is going strong in the Piazza and along the nearby streets. They have some pretty nice things. 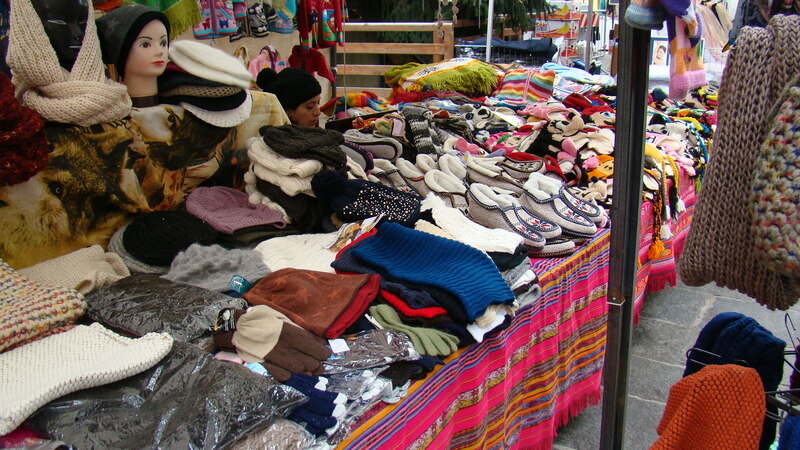 Lots of hand knitted hats and scarves. 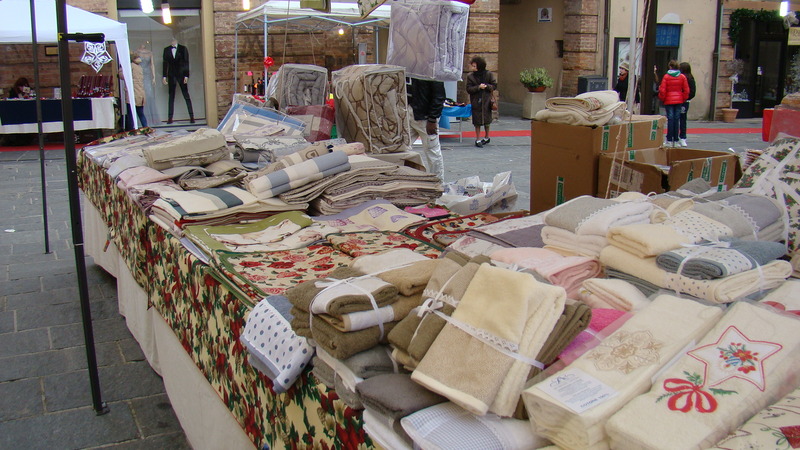 A stand with beautiful towels and linen. 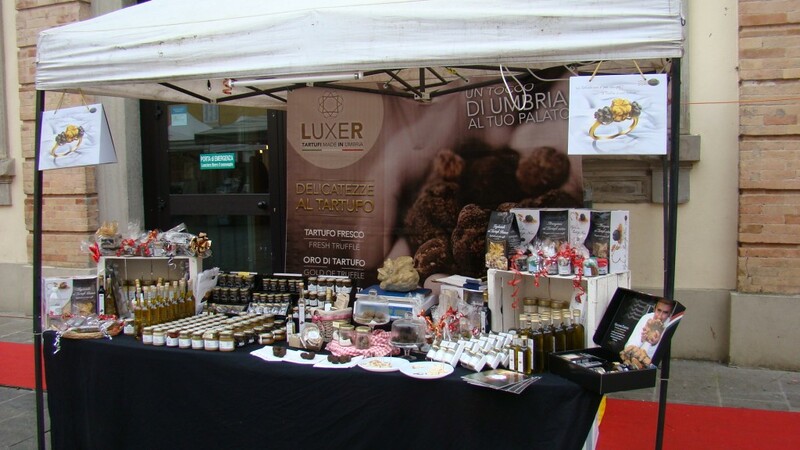 And this could not happen in the US, there is a white truffle stand! I was walking along and caught the unmistakable aroma of the truffles then looked around and there they were. 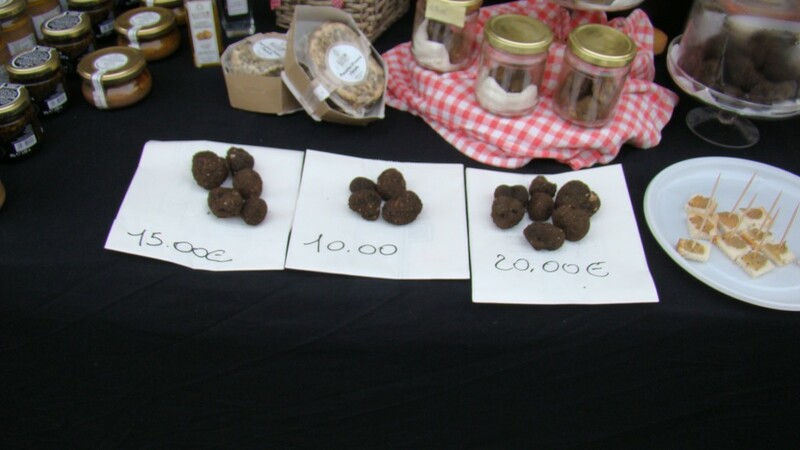 Prices are 10 Euro, 15 Euro, or 20 Euro for a truffle of varying sizes. Did I mention they play music from loud speakers all over town? Mostly Christmas music but they also like the Eagles. 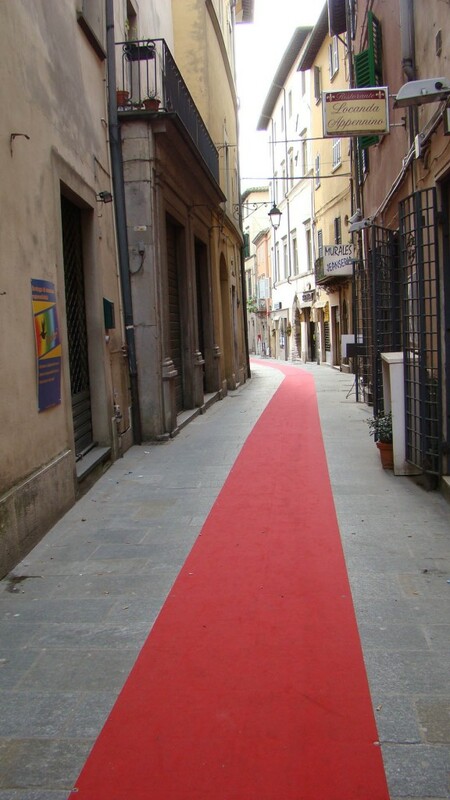 AND they have put red carpets in front of the stores in the Centro and nearby streets. 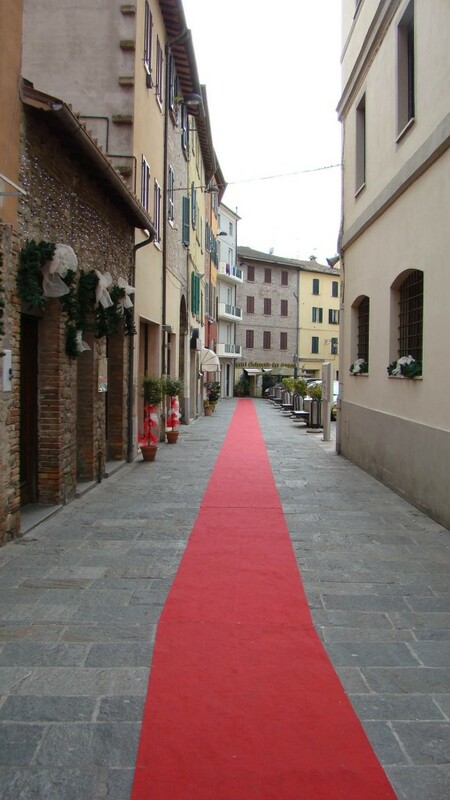 We have a red carpet right down Via Grilli where we live. They have lots and lots of lights up at night on all the streets too. Very festive. 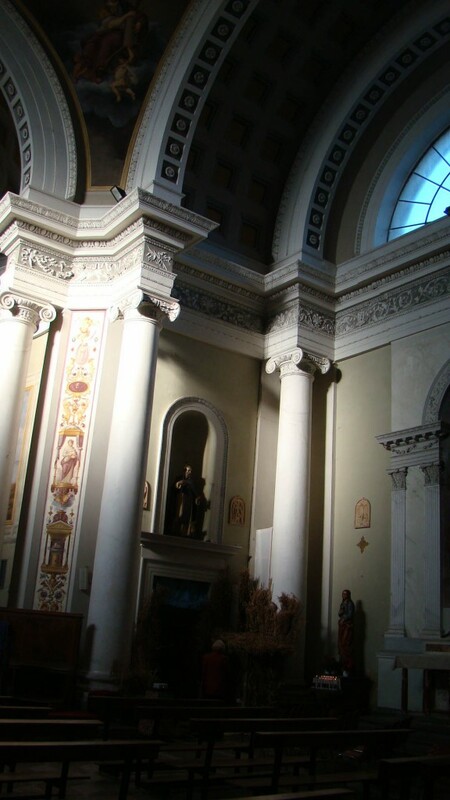 Last Friday we went to an amazing concert in the Church on the Piazza San Francesco. It was a Homage to Mozart played by the Chamber Orchestra of Perugia. There was a wonderful almost duel between the first violin and a woman playing a viola. I had heard that piece before but when you see and hear it in person it is mesmerizing. There will be three more concerts by them between now and the end of the holidays. We will surely go. And they are free. Big turn out as well. We got some AMAZING news yesterday, finally, at long last, our Permessi di Sogiorni are ready for pickup on Saturday December 20. Wow. What a Christmas present. It only took five months. We have to begin the process all over pretty soon. We have gotten our Skye TV set up now and now have more channels that we will ever need. All different languages and lots of English stuff. I have to say, six months without TV was not a problem for me. Right now Luther has found the Padre Pio Network – only in Italy. We also ordered some speakers to be delivered and set up Monday. We have been having internet issues. The WIFI is in the living room and the office is at the other end of the house (not really that far) and we have issues getting internet there. 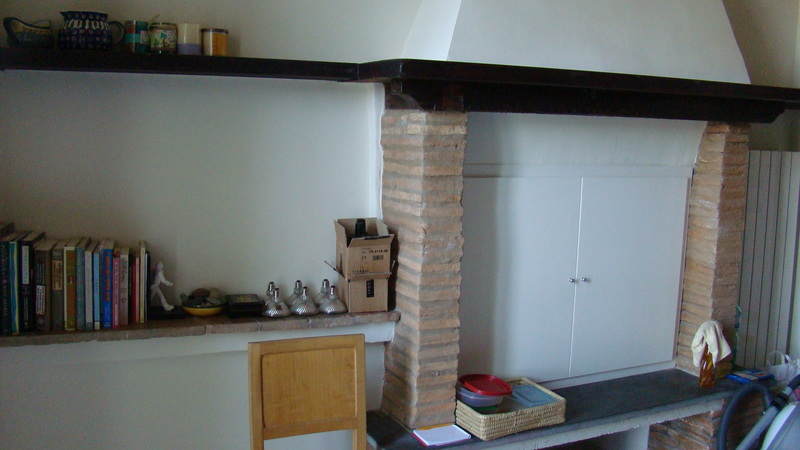 This house is over 300 years old and there are some mighty thick walls which we think are impeding reception. We need to work on this. We are invited to Lynda’s house. She rented us her apartment last January on our house hunting trip. She lives here full time now and is British. She is going back to the UK for Christmas and we are taking care of Sandy her 14 year old cat. We are invited for mince pies and mulled wine and to meet Sandy. How Happy Holidays! We have a busy week ahead. Vera is coming tomorrow to clean Susan and Gary’s apartment that we borrowed. Speakers come tomorrow. We have some buying errands to run. We have also invited our first guests over for lunch on Thursday. We will be six, Susan and Gary and Joseph and Paul. I found some cilantro yesterday and am excited to do something southwestern – or as close as I can come to that here. This entry was posted in Uncategorized on December 14, 2014 by Nancy Hampton. Today is Thursday, one week after Thanksgiving. I am cautiously optimistic that we will move on Saturday. The heat has been fixed and the floors are being finished. 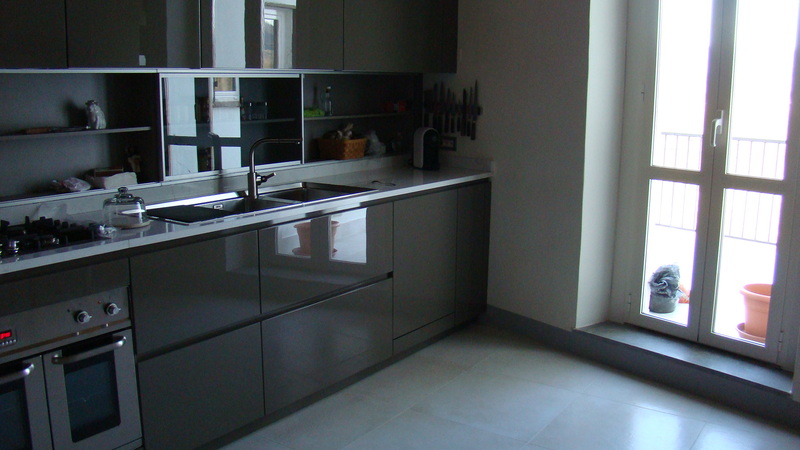 The kitchen has been finished by Pedini. 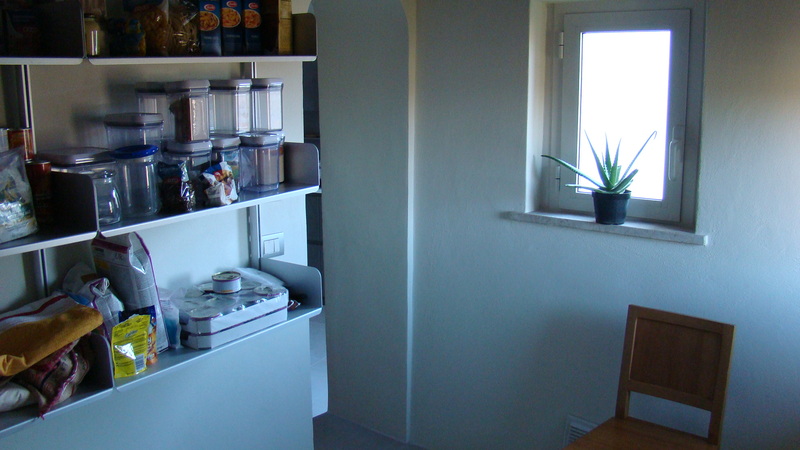 We have shelves installed in the pantry! 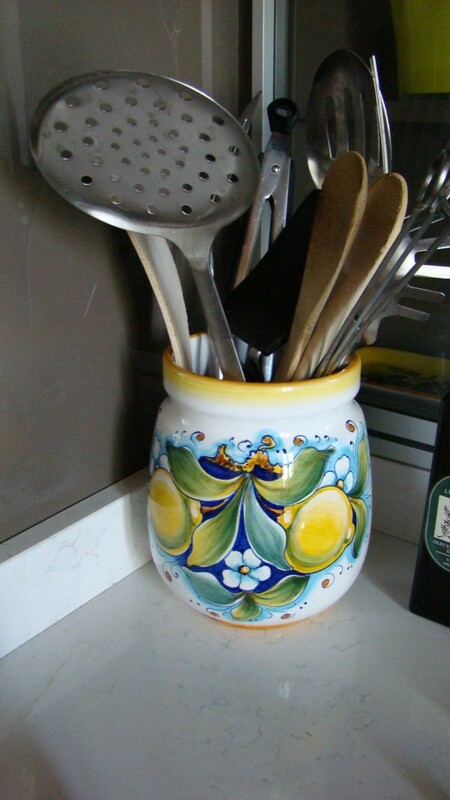 I have been able to do a little organizing of the kitchen. 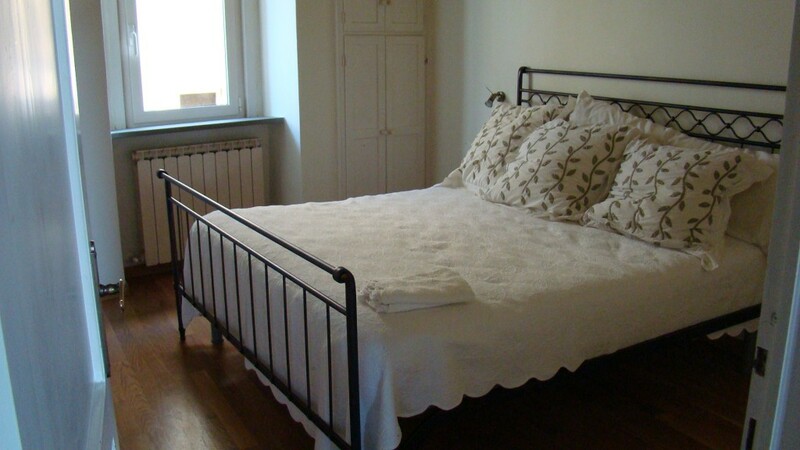 We took a trip to Florence to visit the IKEA there and see how it compared to the one we visited in Ancona. MUCH busier. We went on Monday. I would hate to see it on Saturday! I had a big long list of stuff we need for the house, mostly for the kitchen and bath. 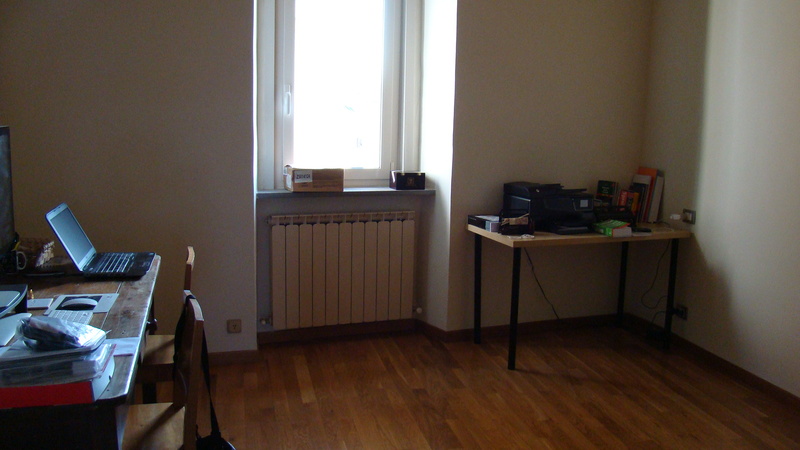 We also bought bedside tables for our room and a bookshelf that will serve as an end table beside the sofa. 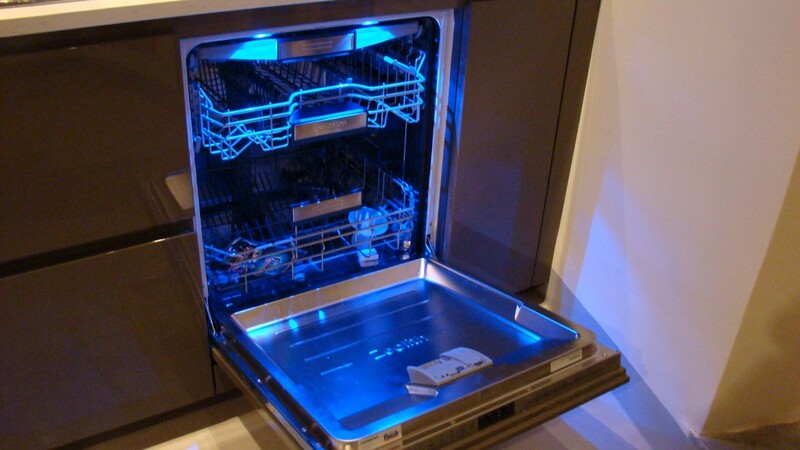 It will have storage as well. We left home at 9AM and arrived around 10:40AM. After we shopped it took half an hour to check out! But that meant it was about 1PM and time for lunch. We drove to Chianti and had a nice lunch in the wine area. Nice folks in the empty restaurant. They gave us a piece of chocolate cake that was awesome. We had taken to calling her Sirena after the voice on the GPS. We hated to see her go. The lease agreement had been extended twice to the limit of the possible term. We had an appointment to drop her off in Rome near the airport at 2PM on Wednesday. We drove to Perugia first to rent another car. I drove Sirena down with Luther following in what we now call the Clown Car, a Lancia Ypsilon. He had a heck of a time keeping up! I kept a close watch on him all the way there as Sirena was guiding me back to her home. It was pretty stressful as I hadn’t really driven much in the 5 months since we had come here. But it worked out OK. So-long Sirena. We drove over to nearby Fiumicino for lunch. We found a staid old restaurant with waiters who may have been there since 1929 when they opened. The food was good though. We kept it to a pasta for me and risotto for Luther. Both with local, delicious seafood. We drove the clown car to it’s limits on the way home and arrived around 5PM after stopping at the Coop for some supplies. That should do it for the catch up. I hope I can have some pictures of our new home AFTER we move in in my next post. Cross your fingers for us! This entry was posted in Uncategorized on December 4, 2014 by Nancy Hampton.